Is Oleg Tinkov listening? 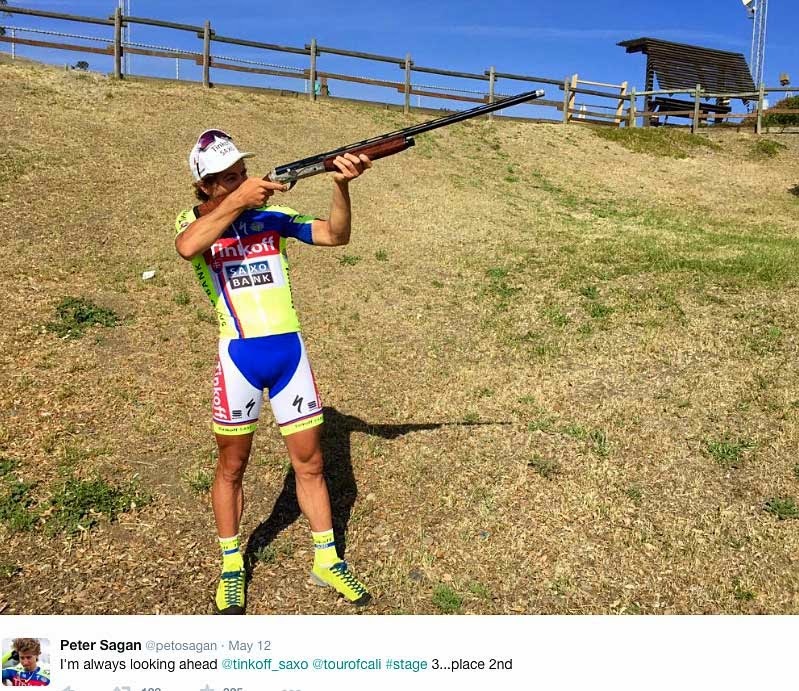 His young charge, Peter The Terminator Sagan answer his pressure tactics duly winning the TT. That's his second stage and now is the leader of the Tour of California. 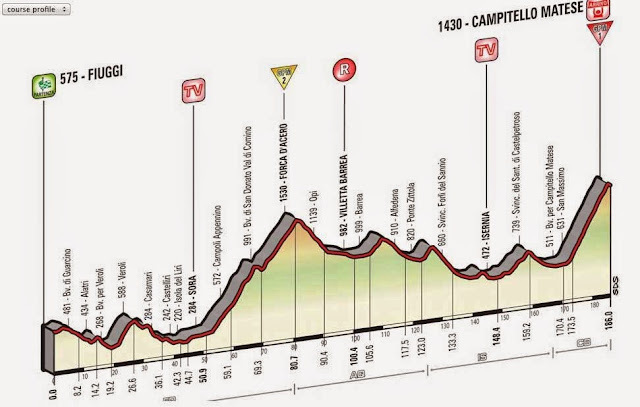 The queen stage is tomorrow and the daunting task is Mt. Baldy. During the post stage interview, Sagan was asked if he was motivated with the shortened TT stage. He jokingly replied he hoped the Mt. Baldy stage would also be changed. You know he's more relaxed when he's joking... and that's bad news for the competition. Even dislocating his shoulder, Alberto Contador is riding worthy of a hero. Today's long stage was 'easy' compare to tomorrow's first mountain stage finishing on top of the Campitello Matese. 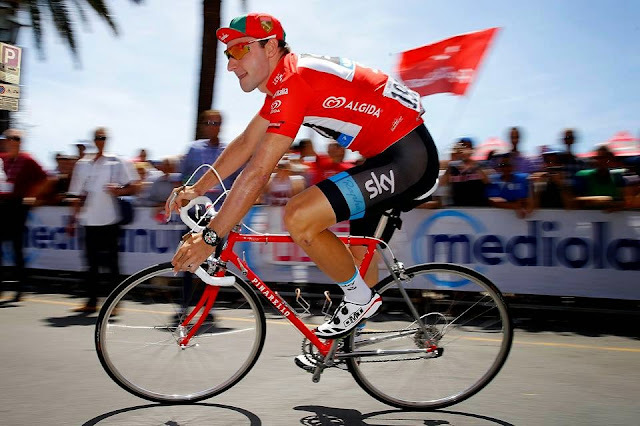 Dancing on the pedals is his comfortable riding style and the pressure that climbing exerts on his arms/shoulders will be the real challenge. not in the peloton but back in the marketplace. Stage 2 winner, Elia Viviani shows off the new Pinarello Veneto Rosso 748. CroMo, down tube shifters, exposed brake cables, a beautiful retro bike from the golden past. Reminds me of the 1984 Pinarello Super Record SLX and my visit to meet the gracious Giovanni Pinarello in Treviso (article here). For a period time their steel frames disappeared, due to the rise of aluminum and carbon, but special thanks go to Cycles Pinarello for their return. Many frame builders are offering steel frames - and to passionate riders, like myself, I couldn't be happier! Note: I've been riding my 1987 Marinoni SL exclusively and can't get my head around the phrase, steel is back. Steel frames have always been around and will continue to be popular. My new Campagnolo 10mm seat binder bolt. 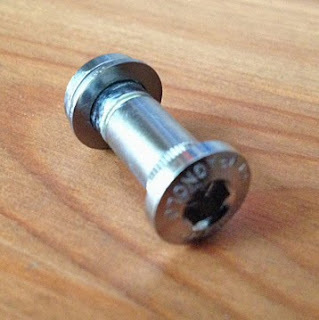 My snapped Campy seat binder bolt search has ended and now, I happily have a new one. I over torqued it and it snapped, my 28 year old seat binder bolt gave up the ghost. It had a great life of service. Thanks to John for turning my attention to Dream Cycle in Vancouver. I'm still somewhat surprise they sell this particular piece. Well they do. Many riders with the older steel frames ask for them. My pro bike shop no longer carries it, special order only requiring 2 weeks wait time. I don't have the time to wait. So, I payed more than what I could find online, but I wasn't worry, supporting local is the best way to go... and also having it straightaway. Thanks Dream Cycle! I don't know what took me so long to decide to have a proper storage tool bottle. Today's ride was the last time I rode with my old version (two old plastic bottles cut in half and bottoms force together version). My new storage bottle, I received today, is the perfect size for; tire levers, spare tube, hex keys, and most importantly my hand pump. I think I can throw in a gel, too. I was getting tired of schlepping my hand pump in my jersey pockets - a cumbersome and weighty ordeal. No more!